WASHINGTON (March 25, 2010) -- Overuse of prescription painkillers by Soldiers -- as reported recently in the civilian press -- may be the result of seemingly unrelenting deployments to both Afghanistan and Iraq. Speaking before the House Appropriations Committee subcommittee on defense, Chief of Staff of the Army Gen. George W. Casey Jr. attributed a rise in prescription painkiller use among Soldiers to ongoing conflict. 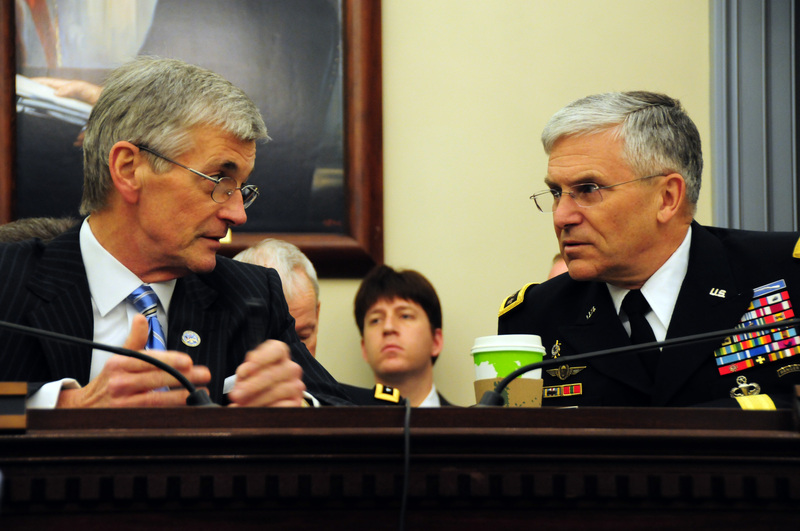 Secretary of the Army John McHugh and Chief of Staff of the Army Gen. George W. Casey Jr. confer before a March 23 hearing before the House Appropriations Committee subcommittee on defense. It's "part of the cumulative effects of eight and a half years at war," Casey told legislators. "It's something -- not a pretty thing -- something we need to get on the table and deal with." A recent article in USA Today said that prescriptions for painkillers to military members have gone up by four times since 2001 -- from just under 900,000 in 2001, to nearly 4 million in 2009. Secretary of the Army John McHugh told lawmakers it is possible that Soldiers, like those in the civilian community, end up seeing multiple doctors and are in turn getting multiple prescriptions. He also noted the distinction between such a situation being deliberate or by chance. In theater, the secretary said, shopping for physicians is limited due to the concentration of Soldiers and the number of doctors available. But still, in theater, "tracking systems are not as reliable as they are here in CONUS," he said. The major concern is stateside, McHugh said. In Warrior Transition Units -- where the most wounded Soldiers reside, and the need for pain management is most needed -- the Army has made efforts to more accurately track prescription drugs. "We have established a program whereby all prescriptions in a WTU go through a single reporting source," he said. "So we have that opportunity to make sure that multiple prescriptions designed to do the same things are not finding themselves into a particular patient." He said he isn't ready to say how effective the program is now, but that the Army is moving "in the right direction." Committee members also expressed interest in the legacy left behind by Future Combat Systems, the Army's multi-billion-dollar modernization program that was canceled in June 2009. In place of the vehicles lost under that program -- which accounted for the bulk of the program's cost -- the Army is now developing a new ground combat vehicle. Casey said there is value in what is left of FCS, including equipment in the form of spinouts that will be fielded to Soldiers in 2011, in vehicle research, and in the network that tied FCS together. "The network is what gives us the ability to operate in any environment," Casey said, saying Soldiers need to know where they are, where their fellow Soldiers are and where the enemy is. "We are in a much better position from the network position because of the FCS." The general also mentioned spinouts from the former FCS, which are now packaged together as "Increment 1" of the Brigade Combat Team Modernization program. "We are getting them to a position to take them forward," he said of the equipment, which includes the Small Unmanned Ground Vehicle, the Class 1 Block 0 Unmanned Air Vehicle, the Tactical and Urban Unattended Ground Sensors, the Non-Line of Sight Launch System, and the Network Integration Kits. The general said he is aware that some of that equipment has performance issues that surfaced in limited user tests, but that the Army won't be handing out any equipment that isn't ready for the field. "We found some warts on them," he said. "(And) we're going to fix those warts." It's expected the 3rd Brigade Combat Team, 1st Armored Division, out of Fort Bliss, Texas, will be the first BCT to receive the Increment 1 networked systems, starting in 2011. The legacy of the FCS vehicles will also influence development of the new ground combat vehicle, Casey said. He said the Army knows where the "state of the art" is on vehicle technology because "we pushed it there." "The $15 billion or so we invested in that program over time was basically a great test bed that gave us the insights we need to move this program forward," Casey said. One of the purposes of the ground combat vehicle is to replace the 1970s-era infantry fighting vehicle, the Bradley. McHugh also told lawmakers about the significant contributions the mine resistant ambush protected vehicle is having on operations. "It's an incredibly important addition to the force structure," McHugh said, noting the challenges presented by terrain differences between Iraq and Afghanistan. He said now there are more than 1,500 MRAPs in Afghanistan, with 160 on the way. The secretary also said the MRAP is "key both in terms of carrying the fight to the Taliban and to anti-Afghan forces." He added that the MRAP all terrain vehicle, or MATV, "is the platform of the moment." Legislators also asked Casey and McHugh about Army energy security and the suicide rate among Soldiers. McHugh said energy independence -- the ability of the Army to continue to function in the absence of the civilian energy grid -- is important to the service. Also, he said, "the Army is going to be the largest fielder of alternative-fuel vehicles in the federal government. We have an aggressive acquisition program for hybrid vehicles," he said. Regarding suicide, Casey said young Americans brought into the Army often do not possess the "coping skills to deal with the challenges we're asking them to deal with." A response to that, he said, is the Army's Comprehensive Soldier Fitness program. To date, he said, some 380,000 Soldiers have taken the program's assessment to help determine their strengths and weakness in five key areas of fitness. The Army has also trained some 800 "Master Resilience Trainers." "We want to bring mental fitness up to the same level we give physical fitness," the general said.